Did you know the Cayenne Coils are 12 bucks each? I say this because VEMS can do the low-power 0-5V signal that the coils take. I am just waiting to hear back from them regarding the cost of the wiring harness with all the sensors that I have requested. I will be going to full COP with VEMS when going that route. Uh, True. But the harnesses and plugs for the coils were WAY worth it. Everything I put under the hood will look OEM. Do you think the VEMS harness prices will be different than on thier webstore? Can you ask them if they make two with the price be less? The price will be alittle more as they will be having sensors added. I am looking at 16 injectors, (better idle control) 8 cyl COP, 1 WB O2, 2 6mm EGT probes, and of course a cam and crank pickup. I can ask about the price for one or two. The brain is just over $1k locally with what I am looking at having in it. The harness will be a tick over $350 or in that area. 1k us or 1k canadian? Wait, what am I saying, they are close to equal now. Are you adding some of the cost options to make it 1k? I thought it was closer to about 700? the price is close to $700 base, add a couple features, shipping, and taxes and it will be pretty much equal to what they are asking. what all are you getting for that price? VEMS + addon modules, and wiring harness for the extra sensors, injectors, COPS etc you listed? Does that also come pre-mapped for your application? That sounds like a pretty good deal actually. I have been considering MSII as a project, but this actually is starting to sound better. See what I mean about stealing your ideas Colin? The $1k cdn gets you a VEMS brain, with the needed parts inside of it for dual EGT probes, setup for COP, full sequential, speed pickup and boost control. The $350 (ballpark) gets you the wiring harness to attach the VEMS to the engine with the needed connectors. If you are going NA, then I would say run MSII V3.0 as it is enough for your application. If you are running a SC, then you can do either though VEMS has a slight edge. If you are running a turbo application IMO VEMS is the way to go as you have dual EGT sensors and can do EGT targeting during tuning, to make sure you are not going to burn parts out. With every standalone system, you must tune it, or have it tuned by a pro for your specific car. This takes alot of time to get it right tuning it by yourself. and the bigger the engine, the more need for a dyno to be able to tune. Think of doing a run in 4th or 5th from 2000rpm to redline. That puts you in jail area speeds. each one has its own tuning characters which you will have to work with and try to figure out. MS has a much larger database of how to do things. So there is help for those with no tuning experiance. VEMS doesnt have as much information out there. So if you are doing your own tuning IMO starting with MS is a good idea so you can get the basics of how things work. I also went to a local store today and got my CSR 925 remote electric waterpump, and will be looking at setting that up and getting the parts made to eliminate the factory waterpump for a larger bearing design. and one that allows the bearing to be made without having to remove the water pump housing from the block. 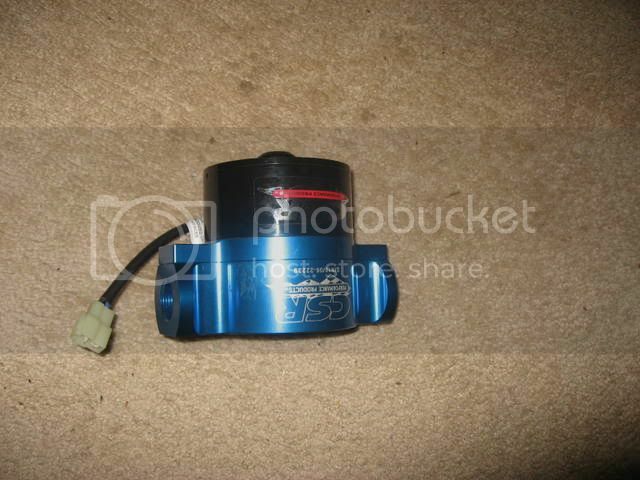 Here is the electric water pump I will be using. Please include everyone in your wp idea. You may be able to save money if others include themselves. I have stated my idea for the water pump in my orginal post. However will describe it again. I am eliminating the factory waterpump with a block off plate. On this blockoff plate I will be mounting as large of a roller bearing as is possible which will have a pulley of probably equal dimensions to the factory, to keep it in the same location/plane. This bearing will not have anything going into the block at all, so no places for the coolant to leak, and the bearing will be easy to change from the outside. I also will be removing the plastic filler bottle from the engine bay and mounting an aluminum filler neck to the coolant bridge area. Colin, you'll need an expansion tank of some sort, to keep a reservoir of coolant that can be used when needed .... as well as a radiator cap for pressure equalisation. So ... what are our options for the water pump (types) and where shall we mount it? OK lol I see you've selected a pump already Details? I saw all that. I mean when you go to do it, see if people want to go in with you on the parts. The pump is a PN 925 made by CSR, flows 35-70 GPM depending on how I mount it and the restrictions in the system. while I agree there needs to be some room for expansion the amount needed isnt that much and the piece which I will be adapting to the coolant bridge will fit a standard rad cap just like the one that the car presently uses. It should be long enough to house the amount of free space needed for the expansion of the fluids. Though if I go with a straight coolant mix (couple of those) then you use a 0-2 PSI rad cap and need even less expansion room, and the car essentially wouldnt overheat with that. Still undecided about the straight coolant style systems.